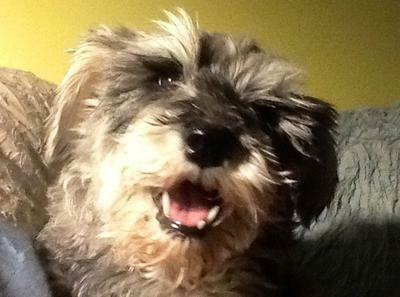 I had recently lost my 11 yr old Schnauzer Lilly unexpectedly in a medical procedure. I had a lovely big rescue dog, Bella, but due to her northern special genes, she was very much an outside dog and I was so missing my Lilly. I searched the Internet for weeks looking for another Schnauzer who needed a home. One day a picture appeared on my Facebook page, a little Schnauzer had been picked up as a stray in the closest major city to my northern town.... only 1000 Kms away. The minute I saw the pictures of this sad little dog, I knew we needed each other. It turned out that Willow was probably a puppymill mamma. After a few weeks of establishing a relationship with the rescue organization, Willow was on her way home to me with a returning niece. She arrived the week before Christmas. She was such a damaged little soul, shivering and fearful. I had to carry her outside 4x a day to do her business and she was so unknowing of dog like behaviours. Following advice from her rescue organization, I fostered a number of inside dogs...... well, it's been 10 weeks now and while Willow is still got a long way to go, she can walk around the block on a lead now and last night I got the best most joyful picture of a toothless furry faced Willow in full smile. I am sooo glad you rescued Willow!!!! She feels the love from you and will continue to respond. However, in my experience, Schnauzer's NEVER forget anything, so even though she will slowly embrace all the positives in her life, now, from time to time, something may remind her of her past and you will be able to tell from her expressions or actions that it bothers her. But, just give her lots of hugs and special attention. It REALLY DOES make a difference!!! Bless you, for rescuing Willow!!!! So happy you have Willow!! I hope and pray she will continue to improve. I am sure she will with your love. Best wishes! Thank you so much for rescuing Willow!